Our WaterGuard® IOS (Iron Ochre System) Perimeter Drain Channel is ideal for managing this difficult problem. The wide-open design of the drain helps it resist clogs, while a removable lid allows for easy access and maintenance. Our drain system is custom-designed to protect and help keep your basement dry all the time! Don't let iron ochre clog your perimeter drain system and ruin your basement! To schedule a free iron ochre perimeter drain quote, contact us by phone or e-mail today! We proudly serve the Ontario area, including Chatham, London, Sarnia, Windsor and many surrounding areas. No matter how challenging your basement problem is, Advanced Basement Systems has the solution you're looking for! Our iron ochre perimeter drain system is customized to handle any kind of iron bacteria issues that may arise -- and is the ONLY cleanable, flushable iron ochre system of its kind! 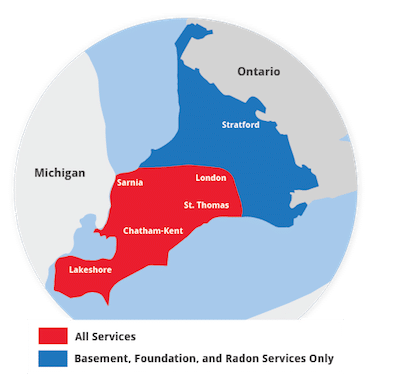 Our experts proudly serve the Ontario area, including Chatham, London, Sarnia, Windsor, surrounding areas such as Stratford, Windsor , Leamington, St Thomas, Amherstburg, Strathroy, Essex, and nearby.